Looking for a home to call your own? Here’s a good choice for those who are advocating sustainable living. Elements Eco-Efficient Residences in Shaw Blvd has eco-friendly and ec0-efficient features and amenities that make green living possible in the city. Food, clothing and shelter. These are known as human’s basic needs. Everyone needs a roof above one’s head and a place to park tired and weary bodies after a day’s work. Recently, due to issues of over-population and inadequate land space in the metropolis, more real estate developers and even homeowners have embraced condominium living. Today’s condominiums come in various types and sizes — from multi-storey high rise buildings to mid-rise or mid-level apartment or flat types and from 21 square meters studio units to large 3 bedroom units. Condominium living has evolved from luxury to necessity and apart from location and price, it must likewise embody comfort and convenience. With the needs of investors and homeowners in mind, GFL Metro Communities Inc., (GFLMC) has raised the bar in terms of architectural standard with Elements Eco-efficient Residences. 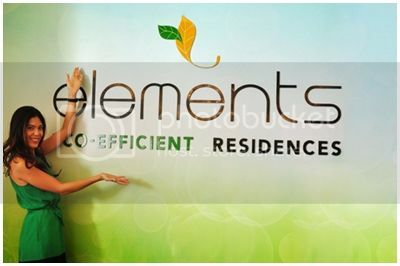 Elements Eco-efficient Residences is redefining lifestyle by being the only condominium in the metro that can boast of eco-efficient and eco-friendly features and amenities that are a cut above the rest. ANC morning show host and former Ms. Philippines Earth Ginger Conejero explained the reason behind her choice of Elements Eco-efficient Residences not only as an investment but also as her potential home. Ginger intimated that she chose Elements Eco-efficient Residences for its eco-efficient features; such as solar panels, green roofs, LED lights, rainwater catchment, smart controllers and low-flow fixtures. She said that the condo’s property management office, has encouraged recycling as a part of the lifestyle of all the homeowners in the units. In addition to these unique and state of the art eco-features of Elements Eco-efficient Residences, Ginger stated that for the homeowners comfort and convenience, it features functional amenities like the sky-garden, where the green roofs are located. She further explained that, “a multi-level hanging garden is incorporated in the midsection of the building to enhance the positive effects of the green roof. Together, the green roof and garden effectively reduce urban air temperatures giving one a cooler and relaxing atmosphere. Conejero expressed her excitement on one of the features of Elements Efficient Residence — The CAPITOL CENTER, a commercial area that will house various restaurants and boutiques where one can wine, dine and shop with friends and loved ones. It also has a fitness gym with state-of-the art fitness equipment , resort-style infinity pool with multiple water features including a children’s pool, open air cabanas and an extended wooden deck for peace and relaxation and roof-top lap pool with open air cabanas, viewing deck, and private jacuzzis; and a wellness spa for invigorating massages and sauna steam baths. “How’s that for entertaining family,friends and for enjoying your own personal time right within the comfort of your own home”, she said. She remarked that other amenities includes: a wifi Lounge – relax in your very own wifi enabled lounge, with dedicated wifi internet access, a function room where residents can host private functions, birthday parties or other events in style, a mini theatre where you can bond with your family and friends while watching a movie or conduct a presentation. It will likewise have a business center right at your own residential area. “This is ideal for those who work from home or for busy-bodies like me who sometimes have to be on call 24/7, rain or shine”. Ginger stressed that Elements Residences is perfect for single people, for couples who are just starting a family and even for small-to medium size families because it is comprised of two 28-storey residential towers with units ranging from 23 square meters one-bedroom unit to 90 square meters three-bedroom units. On top of these, it is conveniently located on Shaw Blvd., Kapitolyo, Pasig which is just a few minutes away from Manila, Makati, San Juan and Quezon City. The towers are close to shopping areas, schools, hospitals and transportation terminals. 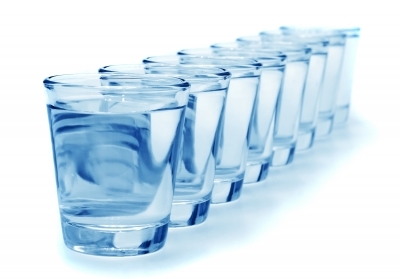 The importance of water to your body’s overall health can hardly be overestimated. While experts agree that the amount of water each person needs daily varies, depending on activity level and other factors, no one argues that it’s not essential. Water helps eliminate toxins from the body, keeps you hydrated and provides good energy. Having a source of good-tasting drinking water has become a priority for many people. And while some don’t mind the taste of tap water, and others don’t mind spending a good deal of money on bottled water, many are coming to rely on water filtration systems that provide better-tasting water but won’t break their budget. Types of household water filters vary. Some of the most common types include water filtration pitchers, water filtration faucet mounts and water filtration systems built into your refrigerator. Pur, Brita and Soma all make various types of filtration systems, and you can also find them in a number of well-known refrigerators, like the Frigidaire water filters at Frigidaire-store.com. The various types of filters make different claims regarding which kinds of particulates and how many water contaminants they eliminate, but the ultimate desire of most water drinkers is water that tastes and smells fresher than tap water. Despite the recent warmer weather, the colder months are quickly around the corner. The cold, brisk air seems to liven the festivities. Hot chocolate, coffee, tea, sweaters and mittens warm the body while one is outside. Still, indoors brings other measures to keep the home and everyone in it warm. Several methods for keeping the home toasty warm are essential to save on heating costs. For instance, effective home insulation is a must. Any leaks within the home and between rooms will spread the coldness throughout the home. Greater usage of various materials, such as rugs and blankets help to keep the home insulated and protect from the cold drafts that can seep into a home. During the night, it is important to cover up with quality bedding, such as decorative quilt bedding at QuiltsnQuilts.com. Quilts are fashionable and decorative, yet cozy and of good quality to block in heat while keeping the cold out. Quilts can be used on beds, but they decoratively adorn sofas and large chairs, which provide warmth when used, but also because they serve as protective barriers that are warming by nature. Thinner quilts can be used in warmer months and several can be used for layering purposes should a night prove to be nippy. Quilts are the perfect home accessory that offers versatile usage and are exquisitely beautiful. Just exactly how long does it take you to do the laundry? I remember a friend sharing on her Facebook wall how it took her the entire day to finish washing all their laundry. Well, I can totally relate to her! I wash laundry three times in a week and it takes me from 8am to 5pm (on a fairly good day) to finish the three to four loads I wash on each of those days. Oh yes, it takes me nine to ten hours to finish a batch of laundry! Wait…before you render judgment on my homemaking skills, keep in mind that I have two kindergarten kids to look after AND have no househelp AND have only a twin tub washing machine. My husband has repeatedly offered to just have our clothes sent to the laundry shop just like we used to. However, I would much rather wash our clothes myself. Aside from the savings, I can also be sure that the kids’ clothes are thoroughly cleaned and germ-free. Besides, I have already learned a few tricks to make washing clothes less cumbersome. You may already know some of these but do read on please. Always turn out BACK POCKETS too! I always do turn out front pockets to check for coins or receipts before putting them in the wash. Back pockets were merely just given a quick peek. Until, one of my hubby’s pants turned out to have a stash of paper tissues in the back pocket which I only discovered when small bits of tissue floated in the wash. Imagine a wash load of clothes all with tiny bits of tissue stuck on them! Well, you bet I scrutinize every single pocket since then. Keep a SMALL JAR FOR LOOSE BUTTONS near the washing machine. In an ideal world, no thread comes lose, no zippers get caught, and no buttons fall off. Ours is not an ideal one though so finding loose buttons in the washing machine is very common. Instead of having to look for the sewing kit or putting the loose button in your pocket (which you’re bound to forget about even before you finish the laundry), place a small jar near the washing machine and put loose buttons there. It’ll save you time looking for a missing button. CHEAP isn’t always ECONOMICAL. When I wasn’t the one doing the laundry before, I always bought the most affordable detergent and fabric conditioner. I found out though that they weren’t that efficient and I ended up using more to effectively wash our laundry. In the long run, these cheap detergents cost me more. Now I only buy trusted and reliable brands. SOAK WHITES AND HEAVILY STAINED CLOTHES the night before laundry day. Doing this would save you an hour or more of laundry time the next day. My kindergartens have a way of turning white clothes to gray so their clothes need to be soaked for a couple of hours. Plus, whites come out brighter with an overnight soak. Doing the laundry is FUN WITH KIDS AROUND. Oh yes, they may stretch laundry time but my kindergarten make this tedious chore fun. They’re not allowed to touch the soapy water – laundry detergent may be too strong for their baby soft skin – but I do engage their help in sorting the laundry and doing the last rinse clothes. They also love helping me load the washer or the dryer. 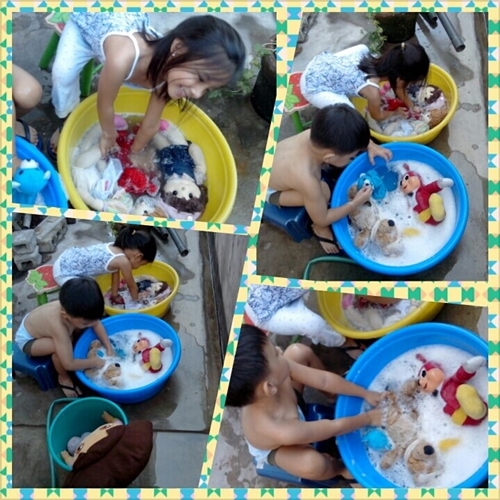 Every now and then, I let them wash their own toys using a very gentle soap. Who wouldn’t love doing the laundry with these two little ones? 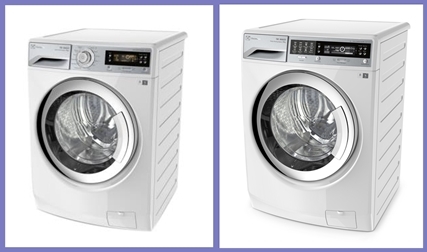 Although doing the laundry with the kids can be fun, I still would rather spend more time with them doing other things like reading books together, making crafts, or playing games – which is why I have my eyes set on Electrolux Time Manager washing machines. Fully equipped with amazing features and the latest technology, this front loading washing machine would give Moms like me more time to spend with our precious little ones and extra time to do other chores. With an Electrolux Time Manager, I wouldn’t be burdened with my washer-spinner-basin cycles that require my checking on the washing machine every few minutes. I’ll be able to put a load on the washing machine, take the kids to school and come home with clean clothes all ready for ironing or folding. That alone puts the Time Manager on top of my home appliance wish list. All its other unique features made me fall in love with it! Load Sensor. This acts like a built-in weighing scale that guides you to select the perfect cycle and detergent recommendation for your load, saving you time, energy and water. Vapour Action. This helps reduce allergens in clothes by up to 99.9% while softening the fabric for brighter and cleaner clothes. Refresh Cycle. This relaxes the fibres and steams out the wrinkles in your clothes, helping it cut down on your ironing. IQ TouchTM. This easy-to-use intuitive panel makes instructions and program settings even easier to follow. Leaf Lifter + Lily Drum. This ensures gentle tumbling while increasing surface contact between the laundry and the drum for a cleaner wash.
Time Manager. Four selectable time options let you wash base on how much and how dirty your clothes are. With all those features, I’m sure you’re also wishing for an Electrolux Time Manager front loading washing machine. The steep price may take you aback but believe me when I say that this would cost you less in the long run. Contrary to what many presume, the Time Manager actually uses less water and less electricity. That means, you not only save time but also utility expenses while conserving water and energy. Moreover, you get outstanding customer service when you get yourself an Electrolux Time Manager. In line with its commitment to provide excellent customer service, Electrolux opened the Customer Service Hub at the Grundfos Building, 5548 Osmena Highway, Brgy. San Isidro, Makati City. Whether you’re a new customer looking to buy that Time Manager or a loyal Electrolux consumer looking for a spare part or a consumable item, you can find what you need at the CS Hub. This one stop facility carries a wide range of Electrolux and White Westinghouse spare parts and accessories. Can’t find what you’re looking for in the supermarket or hardware store? Head off to CS Hub or contact the Customer Care team through wecare@electrolux.com or 845-CARE (2273). As much as I would love to play fairy godmother and give each of you your very own Electrolux Time Manager, I’m just a mere housewife saving for one myself. But, don’t be disheartened. 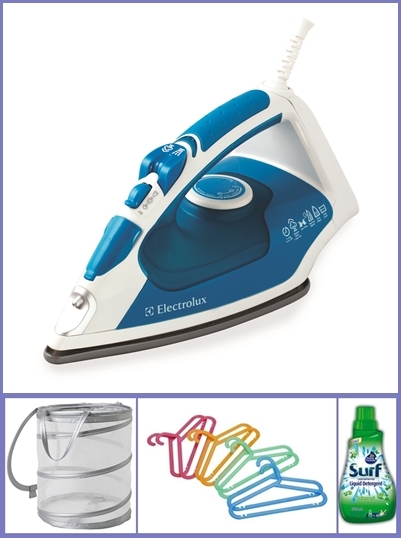 Electrolux is giving a laundry set to one of you dear readers! Oh yes, you just might be the one to bring home the Electrolux Wash Loads of Love Laundry Set which includes an Electrolux Steam Iron ESI 515, a big bottle of Surf Liquid Detergent, a set of IKEA Children’s Clothes Hangers, and an IKEA Silver Laundry Basket. No likes, shares, or follows needed (though they’d be greatly appreciated). Just tell me what your favorite feature of the Electrolux Time Manager is and how you will use the extra time you’d have if you had the Time Manager. What is your favorite feature of the Electrolux Time Manager? How will you use the extra time you’d have if you had the Electrolux Time Manager? Leave a comment with your name, email address, and answers to the questions. You have until 11:59pm of August 18, 2013 to leave your comment. The reader with the best comment will have the Wash Loads of Love Laundry Set delivered right at his doorstep. This giveaway is open to residents of the Philippines only. Shopping for a new mattress is not something that most people look forward to, but if you do everything correctly, you should only have to endure this experience one time in your life. The right mattress should last at least 10 years if not longer. The average person spends at least one third of their life sleeping. Doesn’t it make sense to spend that time comfortably? For me personally, I’ve always found that a latex mattress provides the best support, and provides the absolutely best comfort. But, my husband doesn’t feel the same. He prefers memory foam – each to their own. Everybody seems to have a different style of sleeping and their own version of “comfort” that often develops from childhood. And, with that said, that brings us to the most important tip. Your bed is the one place where you need maximum comfort. If you are not getting a good night’s sleep, then your old mattress could be to blame. The first thing that you need to take into consideration when you start shopping for new mattresses is the comfort of your bed. Whether it is a single mattress or a king mattress you are after, don’t sacrifice comfort for anything. The select comfort line of mattresses was designed to be comfortable for more than one person. A mattress where the firmness can be adjusted is an excellent idea. There is more than one type of mattress out there and many you can compare with each other. For example, leesa vs purple mattress and the more you know about all the different types of mattresses that exist, the easier it will be the pick out the perfect one. Here are a few of the more popular choices. When it comes to mattress shopping, you really don’t have all that many choices. You can choose to shop locally at a specialized mattress retailer, or you can shop from the convenience of your home by making your purchase on the Internet. Both methods have advantages. Shopping at a local retailer gives you the unique opportunity to try out all of the beds. You can spend as much time lying on every mattress in the store. Shopping for a new mattress on the Internet gives you convenience and great savings. Most Internet mattress retailers will also give you a free in home trial for the mattress. This is an excellent way to determine whether or not the mattress is a good fit. Shopping for a new mattress does not have to be difficult. Take your time and you will only have to do this once in your life.